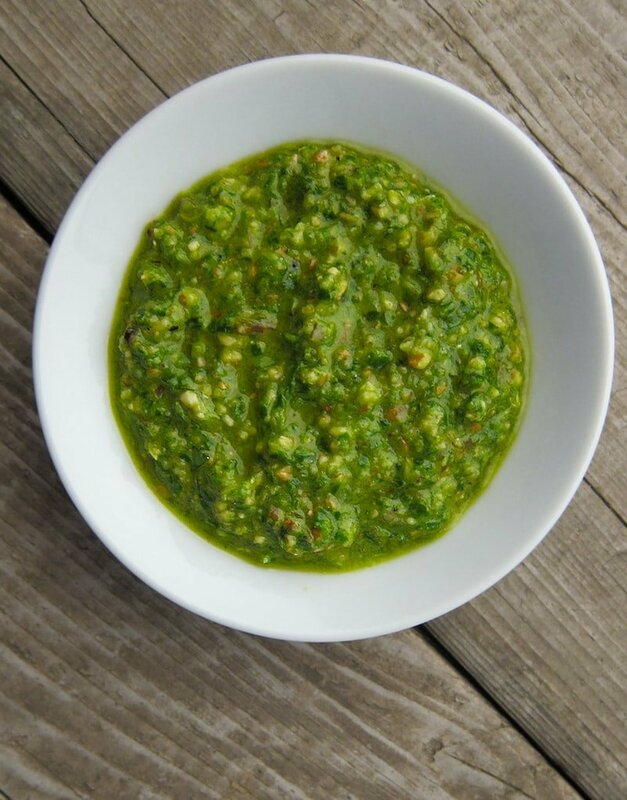 Pesto can be made from really anything: We’ve all seen pesto made with basil of course, but you can also use mint, parsley, cilantro and other herbs. In this case I use ramps (or other wild green onions). This is a great use for ramps of course, but also three-cornered leeks, “lawn onions,” or chives, or really any green onion or scallion. When I make pesto I want it to last a while in the fridge, so I blanch the greens first. 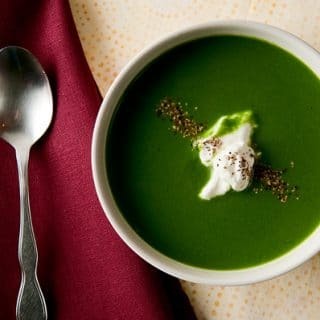 You don’t have to do this, but blanching your green things goes a long way to preventing the dreaded “brown pesto” problem we all face with unused pesto. Blanching kills the enzymes that cause browning. You will need two or three big handfuls of fresh ramp leaves, about 2 cups, chopped more or less — only you’re not chopping them yet. Get a huge pot of water boiling and add a handful of salt. Toss the ramp leaves into the boiling water. Stir around and boil for 30 to 45 seconds. Fish them out with a skimmer or the tongs and immediately dump them into a big bowl with ice water in it. Once they are cool, put them in a colander to strain. Get a cloth towel, like a tea towel, and put the ramps in it. Wrap one end of the towel one way, then the other end of the towel the other and squeeze out as much moisture as you can. My favorite way to use this pesto is with pasta, especially nettle pasta or the easy-to-make pasta shape called gnocchi ricci. It’s also good spread on toast, or with white meats like chicken or pheasant, or with firm fish such as sturgeon, swordfish or tuna. Play around with it. you’ll find what suits you best. 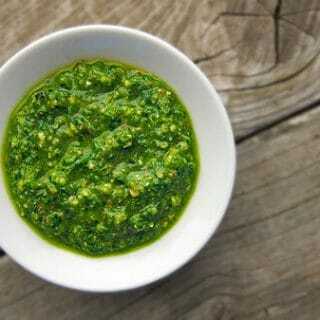 Store any unused pesto in the fridge, topped with some olive oil to keep the air out. It’ll keep this way for a week or so. Any green onion, wild or cultivated, works with this recipe. I've done it with ramp leaves as well as the leaves from Sierra Nevada wild onions, chives, garden-variety scallions and whole three-cornered leeks. If you don't like pine nuts, pecans, walnuts and almonds are fine, too. If you've never toasted nuts before, put them in a steel pan over medium-high heat. Shake the pan frequently so you don't burn the nuts; pine nuts are especially persnickety this way. Pour the nuts out of the hot pan when they get a little brown on the edges. f you are blanching your onions, bring a large pot of water to a boil. Add enough salt to make it taste like the sea. Set a large bowl of ice water nearby. Plunge the ramp leaves into the boiling water for 1 minute. Remove and quickly cool them down in the ice water. Squeeze dry with a tea cloth or paper towels. Start adding olive oil. How much? Depends on how you are using your pesto. If you are making a spread, maybe 1/4 cup. If a pasta sauce, double that. Either way, you add 1 tablespoon at a time, pounding and stirring to incorporate it. When it's a nice rough paste, taste it and add salt if you need to; sometimes the cheese makes the pesto salty enough by itself. Serve as a spread on bread, as an additive to a minestrone (like this one), as a pasta sauce or as a dollop on fish or poultry. If you are using a food processor, add everything but the oil and pulse to combine. Then, turn the motor on the processor and drizzle in the olive oil. Be careful not to let the mixture become a smooth paste! 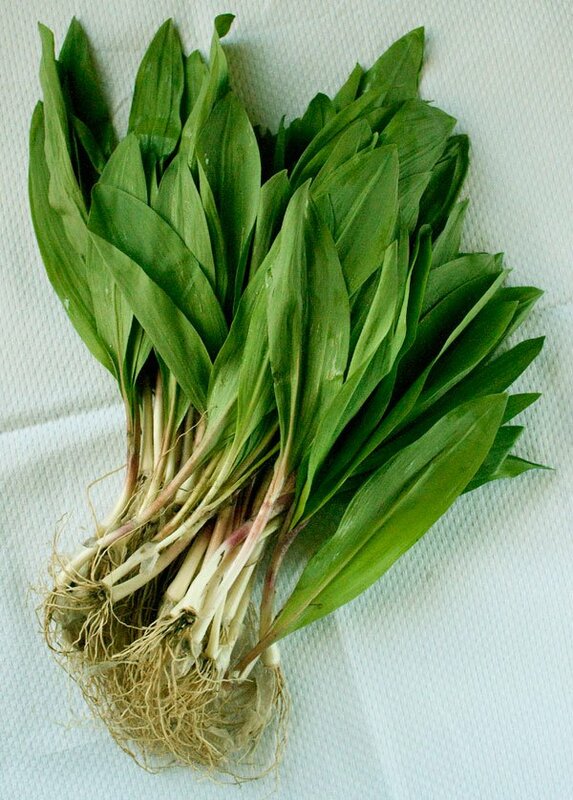 Find more recipes for ramps and other wild onions here on Hunter Angler Gardener Cook!